250 playlists across most of the categories that Apple Music and Spotify feature. For years, the main feature of Pandora's music streaming service has been stations generated from the company's vast Music Genome Project. A system that analyzes songs based on 450 different attributes, it helps Pandora build stations of songs that the company claims go together better than what other services offer. But, the company finally launched a full-fledged, on-demand service earlier this year, and now it's expanding the kinds of music it curates for users. 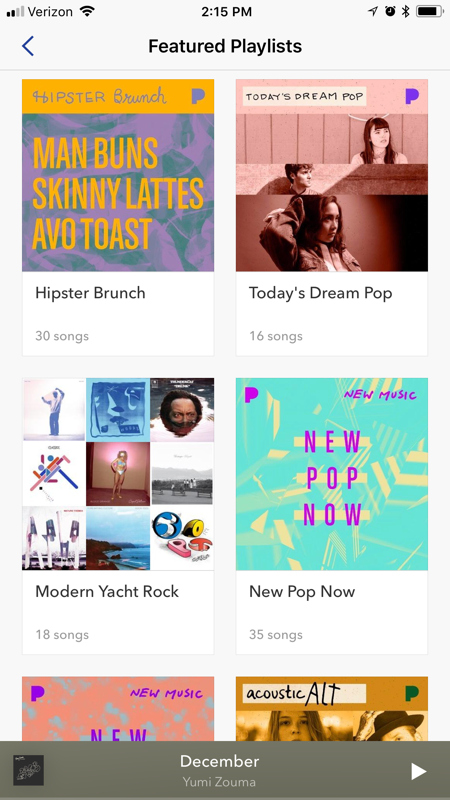 Today, Pandora Premium is launching Featured Playlists, a set of 250 curated playlists across the categories you see on pretty much every other music service out there. Pandora says that in addition to genre-focused playlists, it's also building ones for moods, activities, specific artists and "cultural moments." Premium subscribers will find them at the top of the "browse" section, with a top selection that matches up with the types of music that you listen to most frequently. Unfortunately, if you want to browse them all, there's just a giant scrolling list that you'll need to dig through. If you look under genres, moods or activities further down the browse section, you'll only see Pandora's typical stations. You can of course save any playlists you enjoy to your library so they're easier to find later. Pandora also noted that free or "plus" users (who don't have access to Pandora's full on-demand library) will get access to some stations based on the new playlists. Those stations might not have the exact same songs found in the playlist itself, but they should have the same general vibe. And Pandora says it'll be updating and refreshing the playlists over time, but it doesn't seem like it'll be with the frequency that Apple Music and Spotify update their lists. For that, you're probably better off sticking with Pandora's stations. Most music services put a priority on either playlists (Spotify, Apple Music) or stations (Google Play Music, Pandora). But having a selection of both is a good addition to Pandora Premium, a service that's still adding the features needed to compete with the bigger options. Pandora's new playlists sound good at first glance, and if they make them easier to discover and update them on a regular basis, they'll prove to be a worthwhile addition.